This is my story. I am not an immigrant, I am a proud Canadian. I also happen to be a muslim convert or revert as we call it. My native province is Quebec. My Grandmother on my mothers side was of native decent. Making me part Native. This is an important part of who I am as a person, and also in relation to who I am as a canadian, As the natives were the first dwellers of Quebec. I am proud of my heritage, as I am proud of my Country. This post is not meant to offend but to enlighten. I am also not a religious leader or religious speaker of any kind. I just wanted to share my story and my experience as a Muslim woman living in Quebec. The decision to write this post was an easy one. In light of recent events in Quebec notably THE CHARTER OF QUEBEC VALUES, and a certain degree of intolerance against Muslims (particularly the women who wear the Hijab, or veil or head covering). I felt the need to write this post, partly because I feel helpless to help my fellow sisters in any other way, and partly because I would like to enlighten people as to why I myself have adopted this beautiful religion and also why I decided to wear the Hijab (because despite popular belief it was ME who decided to wear the Hijab.) I was not forced by anyone, it was of my own free will. It was a choice that I made after much thought and a choice that to this day I do not regret. I converted to Islam about six years ago. Before Islam I was quite lost religiously speaking. I knew there was a higher being or God but that was as far as it went. I was brought up as a catholic. Praying before bed time, but very rarely visited a church. I celebrated Christmas, birthdays, Easter. Life was pretty normal, I was just like everyone else. I was a normal teenager, doing normal teenager things. As I grew older, beauty was extremely important to me. I was quite focused on how I looked and what people thought of me. If I compare then to now, despite some negativity surrounding my Hijab, I must say that I feel more respected as a person than before, by men in particular. 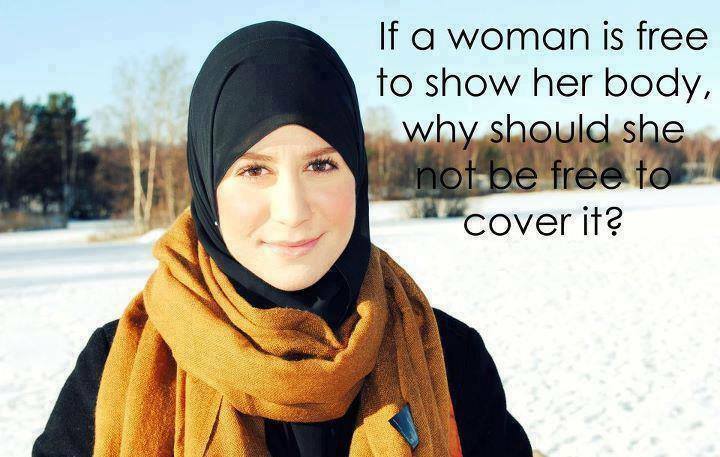 Of course the Hijab does attract attention but it is not the same type of attention as before. The looks are different and I feel more liberated to just be me, without the help of the latest fashion or because I just got my hair done. I am sort of under the radar and it feels great. I feel less pressure to be physically appealing all the time. I also concentrate more on progressing as a person inside rather than focusing on the outside. Ofcourse Muslim women still want to look good and be beautiful but just in our own way, and our husbands are the very privileged ones who get to see all the beauty that is hidden from everyone else. Back to why I converted, I remember that I was in constant search of answers. Where did we come from?, why were we here?? I searched for answers in different religions or philosophies. I was lost religiously. I remember visiting a Scientology church and purchasing a book. I read a lot about Buddhism and for the first time, I felt a little peace. The one thing that bothered me, was the fact that they did not believe in GOD. My brother who was studying Islam at the time, and offered me a book, kind of laughed at me. He would say, "but if there is no GOD how did we get here, and how are we created so perfectly??" I had no argument for him. This is when I realized that while Buddhism was very peaceful, it was not the answer for me. -To be clear I am not judging anyone who does follow this way of life or any other religion for that matter-. So I began to read about Islam, reading everything I could get my hands on. I needed to first erase all previous misconceptions that I had about Islam. You know that Muslims are terrorists, that the religion is one of violence and hate. And lastly that all Muslim women are submissive, shells that cannot think for themselves. Women who are abused and controlled by their husbands and OH MY! men can have four wives???. Even as I write this I cringe at how I use to view Islam and Muslims. Way before I converted, one of my Muslim colleagues at work use to tease me and once said, one day I can see you as a Muslim woman with the Hijab! I remember that moment like it was yesterday. I laughed at him, and said ME A MUSLIM?? ARE YOU OUT OF YOUR MIND??? I AM A CANADIAN AND FREE TO DO WANT I WANT. NO MAN WILL EVER CONTROL ME. I also remember thinking how violent Islam was and wanted no part of it. This of course was before I began to study Islam. We plan and GOD plans and GOD is the BEST OF PLANNERS!!! After much reading and contemplation and erasing my past false misconceptions of Islam I made a big decision. I wanted to become a Muslim. Now I could tell you all that I discovered in Islam, what Islam is, what our beliefs are etc....But I have decided to stick to why I wear the head scarf for the sake of this post. The one thing I will say about Islam is this; The most fundamental belief that we have is the following, We believe in ONLY ONE GOD, THE SAME GOD AS THE CHRISTIANS AND THE JEWS. WE BELIEVE THAT HE HAS NO PARTNERS, NO SON, HE IS ALONE, ONE, WE BELIEVE IN EVERY ONE OF THE PROPHETS FROM JESUS TO MOSES ETC (PEACE BE UPON EVERY ONE OF THEM). We also respect the other religions and if we didn't then we would not be Muslims. That being said after reading the Quran I also discovered many many scientific facts. and I could not deny all the answers that I found in Islam. Answers that I had been searching for for so long. I can now say that the best moment of my entire life was when I converted. I was filled with such emotion, I cannot even begin to explain it. The first time I prayed was also life changing. I had prayed before but this was different. I was truly happy and filled with love and light. Now for my hijab. While I would like to say that I wore it as soon as I converted...That is not how it happened. It took me a good year before I decided to wear it. Looking back I am happy that it took me that long. This is a life long decision and had I put it on too soon, perhaps I would not have been consistent or may have even neglected it. I can say that from the moment I put it on, I felt more like me than I ever have before. If that even makes sense. While everyone assumes that my husband forced me to wear it or that I was obliged because of my religion and therefor had no choice. It was a very personal decision and my husband actually tried to discourage me....Well of course he was very proud of me when I decided to wear it. He just asked me over and over again, are you sure??? It is a big decision and not one that you should take lightly.... I even remember some fellow sisters were telling me not to wear it right away. You see there was a marriage the next day and those girls thought that I should wait so that everyone could see just how beautiful my husbands wife was. I knew I could have arrived with my hair all done up and yes showing my beauty but I decided why wait when I had already made my decision? Should a party come before my hijab?. To me it was unthinkable, that is how important my Hijab already was to me. It had become a part of who I was. Just to be clear, there are Muslim women who choose not to wear the hijab. Does that make me better than them or any other woman for that matter? Not in the slightest. God is the only one who knows our hearts. Just like they have decided not to wear Hijab, I have chosen to wear it. This is a very personal decision. It is a choice, it is my choice. My husband has no say over how I dress nor if I wear the head scarf or not. He does not decide if I wear makeup or if I choose to cut or dye my hair. My hair and body are my own and I choose to cover them both. I also choose to not work and stay home and raise my children. This is my choice. Not my husbands mine. It is also my right. My life is my own, My choices are my own,.There are some men both Muslim or not, who do horrible acts to women and others and some behave in this manner in the name of religion. This is not religion, this is man. But the MEDIA has managed to take the two and have made them one and the same! I once heard a Muslim convert say that she was upset about all the violence that was going on and people doing horrible acts in the name of ISLAM. She said she was mad because it was like those people had hijacked her beautiful religion. That is just how I feel. So back to our topic, why do Muslim women choose to cover their hair??? And why do we wear all those baggy clothes??? Because it is our idea of modesty. It is also mentioned in our holy book the Quran that believing women should cover themselves in such a manner. It is not so different from Mary mother of Jesus (peace be upon him) who use to dress modestly and yes even cover her hair. In the end we do it for GOD. I believe that everyone should have the right to choose how they dress, l also believe that I as a Muslim woman should have that same right. I choose to show my beauty to my husband and family only. I do not wish to impose my way of life on anyone else. I just wish to have the choice to dress and live the way I see fit for me. It is ironic because before I converted I felt more accepted by my fellow Quebecors. I dressed just like everyone else, celebrated the same holidays etc....Yet I always felt as though something was missing. When I converted, I felt at peace and almost like I had finally figured out who I really was. As I mentioned before I no longer worried constantly about how I looked....I began to concentrate on who I was inside, and what was important to me. The ironic part is that as soon as I put on my hijab, I was no longer easily accepted. I was looked at in a very different way. Sometimes negative and other times positive. I have been yelled at by passing cars, eyes have been rolled in my direction. On the other hand I have also been greeted very nicely, doors have been opened for me. Kind words have been said. There are very open minded and accepting people in Quebec but there is also a lot of intolerance and ignorance. Two things that I did not know existed until I put this little piece of material on my head. As for this Charter of Quebec values, I do NOT agree with it!. I worked in customer service for several years both with and without the hijab and it was never an issue. I performed just as well with my Hijab as I did without it. I still greeted everyone with the same courtesy and smile as I had before. Clients still joked around with me, and after a period of adjustment realized that I was the same person as before. My religion had changed but that had nothing to do with the service that I was offering them. The Government says they want everyone to be the same, well I agree to some extent. Everyone should be the same, treated equally, have equal job opportunity and be judged not by their appearance or clothing but by how well they can perform their duties. Whether this Charter passes or not, the employment opportunities for all Muslims (particularly Muslim women) will decrease. The intolerance will increase. This bad seed has been planted into everyone's mind already. All to distract from the real problems in Quebec; EDUCATION, FRAUD, and the ECONOMY. Let us not forget that there have already been several incidents against Muslim women since talks of the Charter have started. . The government says they are all isolated incidents but when there is more than one, I would hardly call them isolated. The Charter is giving the ignorant people a free pass to spurt hateful comments to fellow human beings. While they say that intimidation is not tolerated here in Quebec, the Charter is in contradiction with their words! Life is now uncertain for Muslims here in Quebec. I am sure of one thing, my Hijab is a part of me, a part of who I am. Just like my native heritage here in Quebec. The Hijab is a very sacred piece of material upon my head. As it is to all Muslim women. If it comes down to making a choice between the Hijab and a career here in Quebec, the choice will be a very easy one to make. This post was meant to enlighten people about the head scarf and my reasons for wearing it. I hope I have taught just one person something new that they did not know before, about Islam and the hijab. I also hope that Quebec will again become a province that I can be proud of living in. I hope that Quebec will follow the rest of Canada`s lead and become more tolerant and open minded, and concentrate on real problems instead of creating false ones. The charter states that Quebec wants to be Neutral. They are banning all religious symbols including the HEAD SCARF. However, the cross around the neck can stay as long as it is small. The cross in parliament can stay because it is part of the Quebec haritage. They will keep Christmas and Easter also part of the Quebec heritage. A neutral state that will be keeping not so neutral religious signs and refusing others. Leave well enough alone, because these changes will only invite conflict and intolerance. I SAY NO TO THE CHARTER OF QUEBEC VALUES. Update: The Charter did not pass, and in a recent election the prime minister (Pauline Marois) lost by a landslide. With only 30 seats in the 125 seat National Assembly. April 8th 2014.